My mom is now in Pacifica Senior Living Spring Valley. It's awesome. The staff members are very nice. They do six activities a day, Monday through Sunday. They have a beauty salon, a gym, and a coffee shop. The place is awesome. My mom is eating more. The dining area is very nice and very clean. I was looking for a place that would take care of a patient with Alzheimer's and not let them just sit in a chair and stare at a wall, and I found that at Pacifica Senior Living Spring Valley. The staff members seem genuinely interested in the patient and are very helpful. The room, amenities, and common areas are very nice. My mother's room in the Alzheimer's home is a shared room. They have the appropriate activities for their clients, like coloring. It's good value for the money. Pacifica Senior Living Spring Valley is clean, very light and bright, and friendly. It has a great energy. The residents are up doing things and being active. The caregivers are extremely hands-on, very kind, and caring. My dad could not have been in a better place. I've been there every day of the week, every time of day, and it's always clean and orderly. The patients are not in their rooms during the day. They're out doing activities. It's a very good place. My family and I have eaten there a couple of times, and the food is good. My dad said the food is pretty good as well. They're very reasonable for what they offer. I visited quite a few but I ended up going with Pacifica Spring Valley. For my godfather, the room was set up for two but there is one in the room. The room is fine. It has two beds and some furniture. I guess I can say it is just what you expect from a memory care facility. They seem to be doing OK with everything over there. They have a little patio area but no exercise room. They do the Wii, have activities, have groups that come in for karaoke and singing, and games. Pacifica Senior Living Spring Valley was one of the places that responded to my query early. I liked their arrangement. They seemed to be very caring people, and as it turned out, they are. They listen to the caregivers and the residents. My husband is still in the early stages, so he can communicate, and they've been very responsive. What impressed me was that it wasn't an overly large community. It's small, so he doesn't get lost. It's small enough where they can pay attention to every resident. They do activities, and I even did an activity with them. They have a woman who comes and does a drumming session to energize the individuals. I felt energized after doing the first one with them. The food is good and varies with diet. They give them two choices with each meal, but the food could be a little warmer when it's served. I haven't had any major complaints with the meals I've had. The common ground area is still a work in progress, but what they've accomplished is very well done. I enjoy the fact that they have a walking track around the building, which we have utilized on good days. They also have indoor enclosed patios, which is a very good idea. The residents can sit out and be outdoors but still be safe. They do keep them safe. There have been no illnesses or anything that I noticed and this is going on his second month. They keep the place clean. Thank you for your positive and detailed review! We are very proud of our community and memory care program. We appreciate you sharing your experience and point of view. We also like our community and the close family feel we have here. We post weekly pictures of our residents and their interesting activities to our Facebook page. (The link to the Facebook page is on our website). We are here to make sure that you and your family are happy. Please feel free to reach out to us at any time, thank you again for your review. The staff and residents of Pacifica Senior Living Spring Valley were fine. They were doing an Italian theme, so everything was Italian throughout, which was kind of cool. The atmosphere seemed casual. It was clean, and everything was fine, but the place was full. The best way to get to know a community is by scheduling a tour. 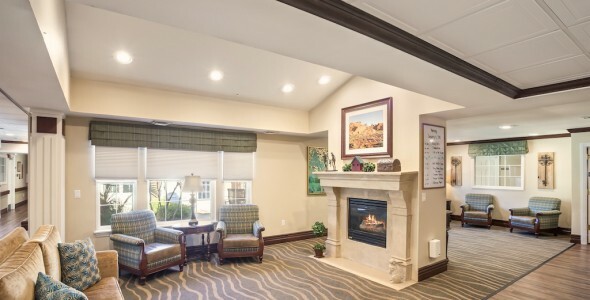 See the facilities, meet the staff and residents, and get a feel first hand what it's like to live at Pacifica Senior Living Spring Valley Memory Care. Pacifica Senior Living Spring Valley offers a homelike setting and cheerful smiles from our professional staff who greet you every day. Our caring staff offers the assistance you need while respecting your independence. Our peaceful setting, restaurant-style dining experience, activities and beautiful surroundings combine to create a wonderful living environment every day. Our genuine, caring staff, home-style meals and daily activities add to our residents' daily experience. They will tell you they appreciate all the options while living at our community. Our customized care plans offer just the right complement of additional services, from assistance with medication to daily help with bathing, dressing, grooming and ambulation. Our tiered levels of service ensure that you are only paying for the services that you need. The sense of community is all around you when you become part of our family at Pacifica Senior Living Spring Valley. Through special events, activities, clubs and on-going cultural enrichment programs, we offer unlimited opportunities for you to get to know other residents and us. Call to set up an appointment for a tour because we delight in showing you our home.